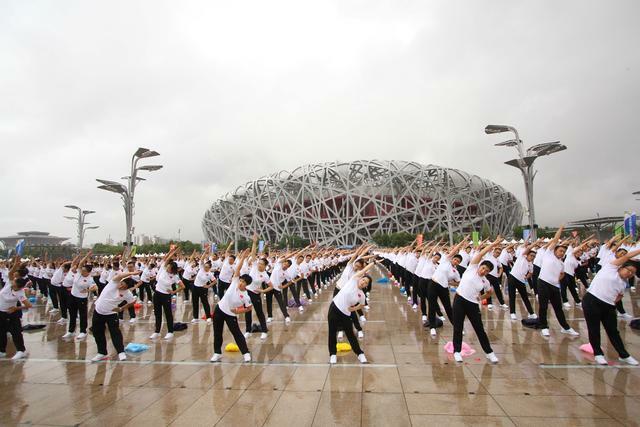 Beijing 2022 today joined in celebrations marking the 10-year anniversary of the 2008 Olympic Games, which kicked off a series of events across China to celebrate the legacies of the 2008 Games over the next few weeks, including sport demonstrations, exhibitions, and documentary films. Among the exhibitions commemorating the 10-year anniversary, the “From 2008 to 2022, Olympic Spirit in Motion” exhibition at the “Bird’s Nest” stands out with a rich collection of Beijing 2008 memorabilia and “Stadiums, Past and Future”, an exhibit developed by The Olympic Museum in Lausanne, Switzerland about the challenge of creating sustainable stadiums. Organized by Beijing Olympic Development Association, it also features a special Beijing 2022 exhibit, and will be open to the public until September 22. The Beijing International Sports Film Week will screen “The Everlasting Flame,” the official film of Beijing 2008, as well as official films of Rio 2016, London 2012, Vancouver 2010, Nagano 1998, and Los Angeles 1984 in theaters across the city from August 8-13. More than three thousand people gathered in the Olympic Park in the early morning to practice table tennis, badminton, football, basketball and popular Chinese folk sports like jianzi, on the 10-year anniversary of the Games, which also marks China’s 10th National Fitness Day, coinciding with the opening date of the 2008 Games every year. The demonstrations of sports were preceded by the launch of a global design competition for the mascots of the Olympic and Paralympic Winter Games Beijing 2022. The event took place in the plaza between the “Bird’s Nest” National Stadium and the “Water Cube” National Aquatics Center, two iconic venues from Beijing 2008 that will be used for Beijing 2022, as the opening and closing ceremonies venue and the curling venue, respectively. Beijing is set to become the first city in the world to have hosted both the summer and winter editions of the Olympic Games. With Beijing enjoying the honor as a “Twice Olympic city”, preparations for Beijing 2022 have been benefiting tremendously from the legacies of Beijing 2008. Of the 13 competition and non-competition venues in the Beijing zone, the majority are existing venues from Beijing 2008, laying a solid foundation for Beijing 2022 to be truly sustainable Games in the spirit of Olympic Agenda 2020’s “New Norm”. Like the “Bird’s Nest” and the “Water Cube”, Beijing 2008 venues National Indoor Stadium (gymnastics/handball to ice hockey), Wukesong Sports Center (basketball to ice hockey), Capital Indoor Stadium (volleyball to short track speed skating/figure skating), and China National Convention Center (fencing/International Broadcast Center to Main Press Center/International Broadcast Center) will all be used for Beijing 2022. In addition to venues, Beijing 2008 has left a unique legacy of Olympic knowledge and talent. More than a third of the Beijing 2022 staff were involved with Beijing 2008, working for the preparations of China’s first Olympic Games in various capacities. One of the most important collective memories and formative experiences for an entire generation in China, Beijing 2008 has also inspired numerous young Chinese to embrace sports and Olympic values. Having experienced the 2008 Games as teenagers, some of these youth have joined Beijing 2022. Beijing 2008 has bestowed upon the hosting city and nation lasting tangible and intangible legacies, not least the goodwill and friendship between the Chinese people and people from around the world. Inspire the youth with the Olympic spirit. Encourage millions of people to embrace winter sports. Promote social progress through the Winter Games. Create a harmonious world of better mutual understanding.